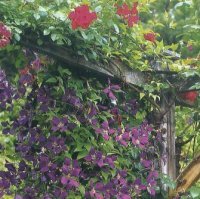 We have the humble cottage garden to thank for our love affair with climbers. In the cottage garden space was at a premium, these charming plants clambered over walls and trees to delight the eye and lead it upwards. In the modern garden, we still appreciate their ability to transform the smallest space with their colourful flowers and heavenly scent. Always container grown plants: In contrast to annual climbers, which are normally sold as seeds or as pots of seedlings, all shrubby climbers should be bought as mature plants in containers, or as small potted plants. These rooted plants are in just the right condition to grow in your garden. Do not be tempted to buy climbers that are sold with bare roots. 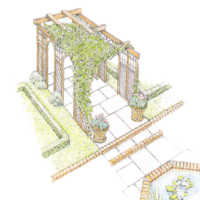 A healthy climber will have several stems growing from the base and its foliage will not be dry or discoloured. When to buy: Although plants in containers are available all year round, it is still best to buy a climbing plant in early spring or at the beginning of autumn. These are the best times to plant, which also means you will probably have the best selection of healthy plants to choose from. Prices climb too: Don’t be surprised if you find buying climbing plants to be an expensive business. Some plants will cost more than others, depending on the size of the rootball and how many stems it has. Generally the older the plant the more expensive it will be. Some plants have been grafted onto a rootstock and then grown on at the nursery for several years, and the price will reflect this extra nurture. lf a wall belongs to your property entirely or is a party wall, you are perfectly within your rights to grow a climber on it. However, a plant should ideally not spill over the top of the of the wall into your neighbours’ property without their agreement they are certainly within their rights to cut it back if it does. If you rent your property or live in a block of flats, you must obtain permission from the landlord or managing agent before planting a climber. Should you buy a large climber? : Sometimes in garden centres you will find large climbers, two metres or more tall, sold in large pots and often already in flower. You can buy them with confidence, but for the best results grow them in planters where they will create an immediate decorative effect. For the garden, it is better to choose younger, smaller plants in containers, no more than 1.5 metres tall. 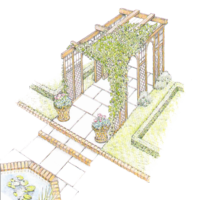 These will establish more quickly than larger plants, which may not flower for a year or two if planted out in the garden, and will grow so fast that in two years they will reach the same height as the larger climbers. Planting out - spring or autumn? : Plants in containers can be planted out all year round, except during periods of frost, flood or intense drought. If at all possible it is always preferable to plant out in autumn so that the roots have time to develop while the soil is still warm from summer. They will also benefit from the winter rain. 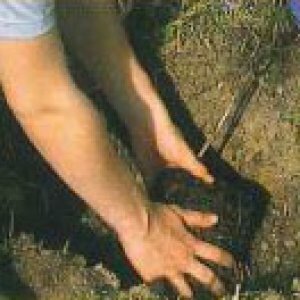 In heavy soil that stays wet all winter, it is better to plant out in spring. Close but not too close: If you want to train a climber against a wall or tree, plant it 30cm away from the support. If it is any closer, any rain that falls will be deflected by the wall or tree, and the plant will not receive enough rainwater to grow. It will soon make the leap onto the support and start climbing. Keep cool: Most climbing plants like to have cool roots. You can easily achieve this by covering the soil around the base of the plant with a thick layer of mulch. Make sure that the mulch does not build up around the stem of the climber or it may impede the circulation of air around the base. Provide shade by placing a tile or opaque screen at the base of the plant. Planting an evergreen close to a climber will also create beneficial shade for its roots. the heat generated by the wall in summer. The best way to create this space is to place small pieces of wood or plastic spacers between the wall and the support. To make it easier to take the trellis down if you need to paint or repair the wall, do not fix it to the wall itself but instead attach it to hooks screwed into the wall. Then, when necessary, you can simply lift it up, with the plant in place, and lay it carefully on the ground beneath the wall. 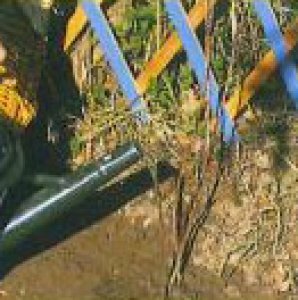 Watering basin: Build up a small ridge of soil in a circle around the base of the plant, on top of the mulch, to create a watering basin. This will collect any water - when it rains and when you water the plant � and direct it so that it penetrates the soil around and above the rootball. Keep the watering basin intact for at least the first year after planting your climber. However, if you live in a particularly cold area of the country, you may want to remove the watering basin in winter, to avoid creating a frozen puddle around your plant. Soil conditions: Most climbers are tolerant of a variety of soil types. For the best results make sure you mix in plenty of well-rotted garden compost in the planting hole. Specialist tree and shrub compost may also help. This will improve the water retention of the soil, and add Vital nutrients. 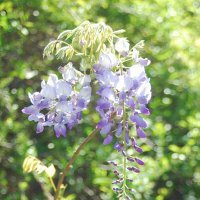 In extreme alkaline conditions, Wisteria plants may develop yellow (chlorotic) leaves. Try watering the plant with sequestered iron or by using an acidifying mulch. 1. Dig a deep hole a little in front of the support. Lay the rootball in it so that the stems lean towards the support. 2. 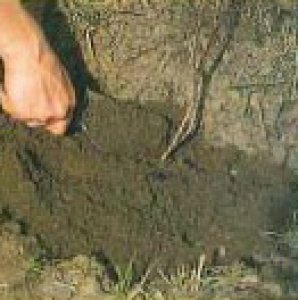 Fill up the hole, covering the rootball and the first five centimetres of the stem with a mixture of soil and well rotted compost. 3. Water generously to get rid of any air pockets and give the best chance of taking root. 4. Protect the base to help keep the roots cool. Clematis love ‘a warm head and cool feet’.